More Alike Than You Might Think! 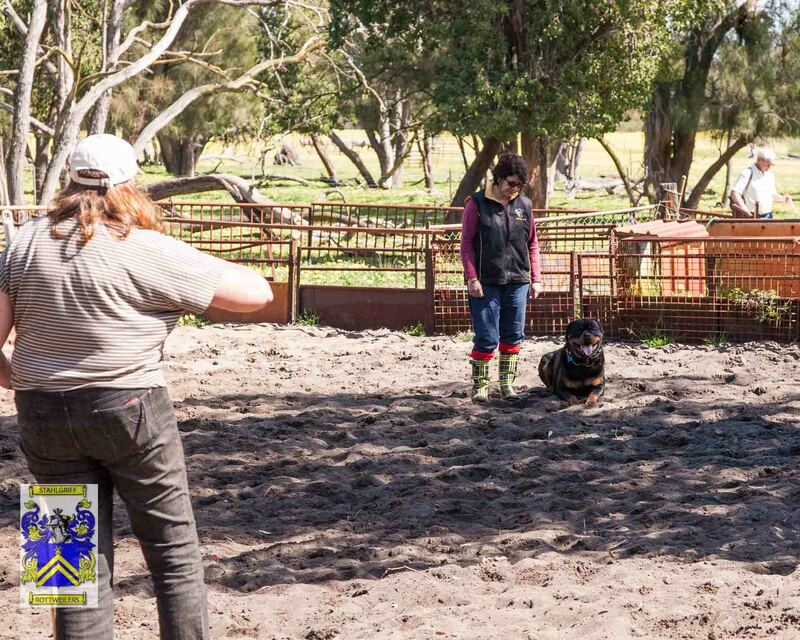 How do herding and the herding dog relate to Schutzhund? Schutzhund was originally started with the German Shepherd dog in Germany. The object was to assess the working ability of the German shepherd, the herding dog. Sheep herding for the German Shepherd was declining so GSD enthusiast Max von Stephanitz, whom is the master of the driving force behind the German Shepherd, originated schutzhund as a sport, to evaluate the working ability of the dog. Schutzhund is the representation of the character and quality of a dog as a superior breeding stock in the absence of the traditional ability to herd. The complicatedness of the schutzhund trial and adversity of the sport would surely determine the much superior dog whom is physically or temperamentally suited to complete the title of Schutzhund "The working dog". The first Schutzhund trial was held in Germany in 1901. These steps were taken to point out the correct working temperament and ability in the German Shepherd breed. SV (Germany), the parent club of the breed, developed the Schutzhund trial as a way of improving and maintaining a reliable dog with the intention that it would be suitable for breeding. 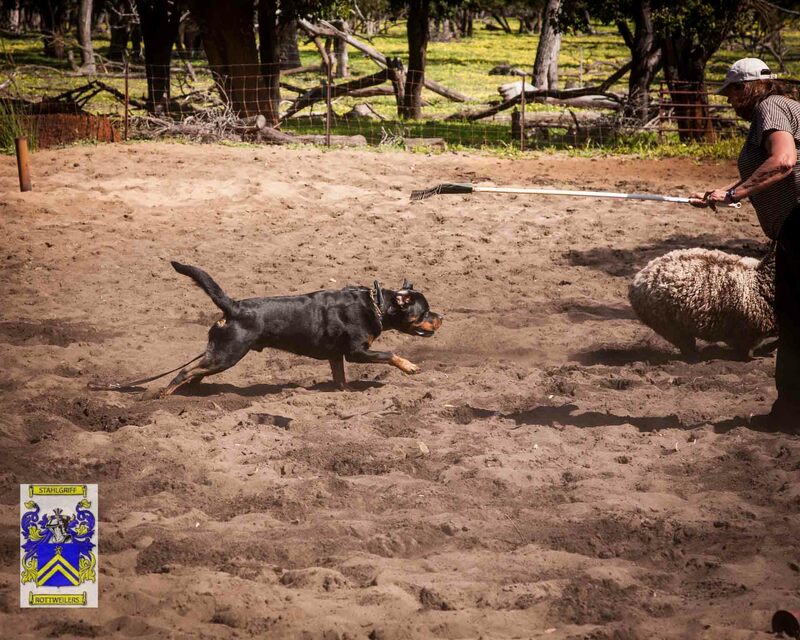 Overtime other “working” breeds were included in this sport (such as the Rottweiler) as their traditional herding working roles had declined. Here are a few thoughts on the subject. Think about your Schutzhund protection exercises and the flock herding exercises. Up close, the Herding dog must hold its ground, hold the boundary, against the pressure of hundreds of hungry livestock wanting to get to the good crops on the other side. For this, the dog must have the temperament, courage and sound nerves to command the respect of the flock by showing that it can and will use its bite to grip when and where necessary. When challenged or charged by sheep (or cattle) leaving the graze or on the road, the Herding dog must have the temperament, nerve and courage to fight back and to teach the stubborn sheep or livestock a lesson with a firm strong grip. 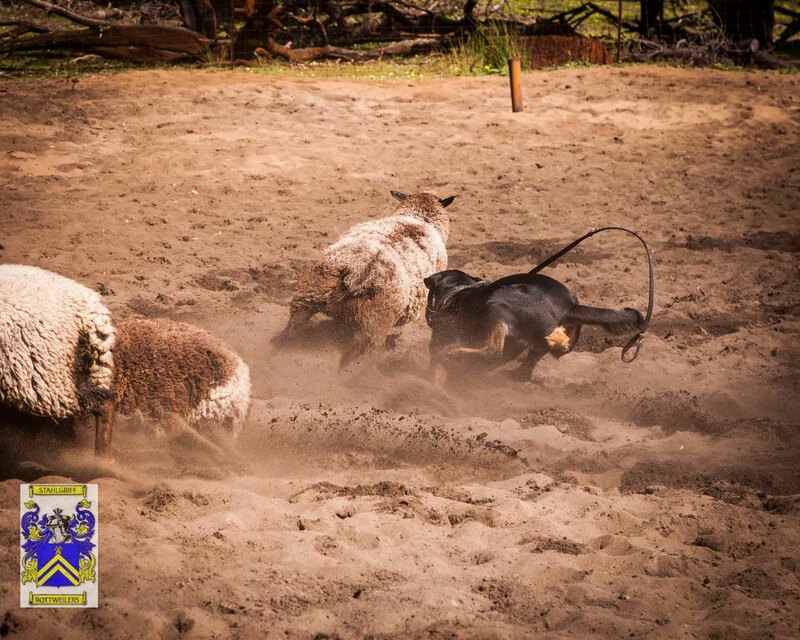 Sheep, goats and cattle have horns and have the potential inflict serious wounds on the dog. The Schutzhund bark and hold requires the dog to find the man in the blind and to hold him there without biting him, as long as the man stays in the blind — the herding dog is required to hold the sheep inside the graze without gripping them as long as they stay inside the graze. 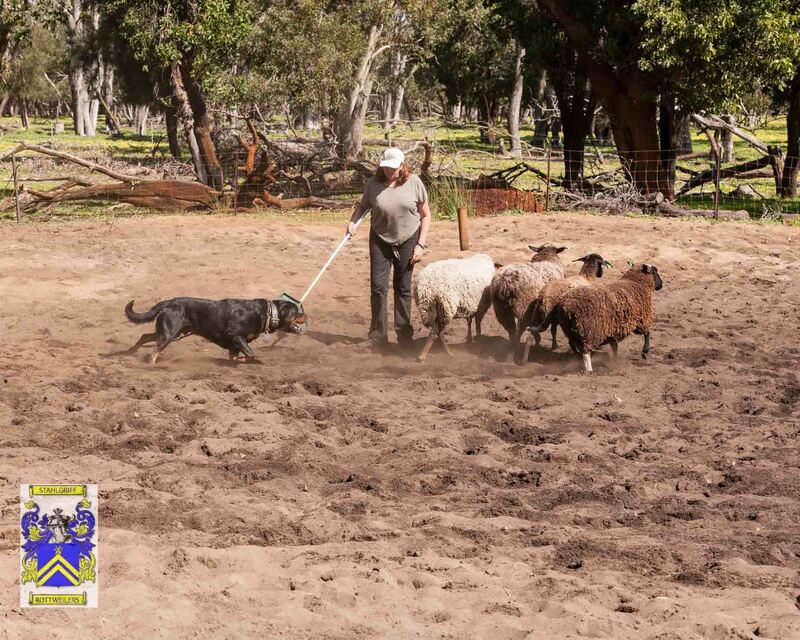 Also, the Schutzhund escape from the blind requires the dog to bite the helper as soon as the helper moves to escape and to hold the helper as long as he struggles, fights and hits — the herding dog is required to grip the sheep if a sheep tries to leave the graze and to release the sheep as soon as it stops struggling or heads back into the graze. 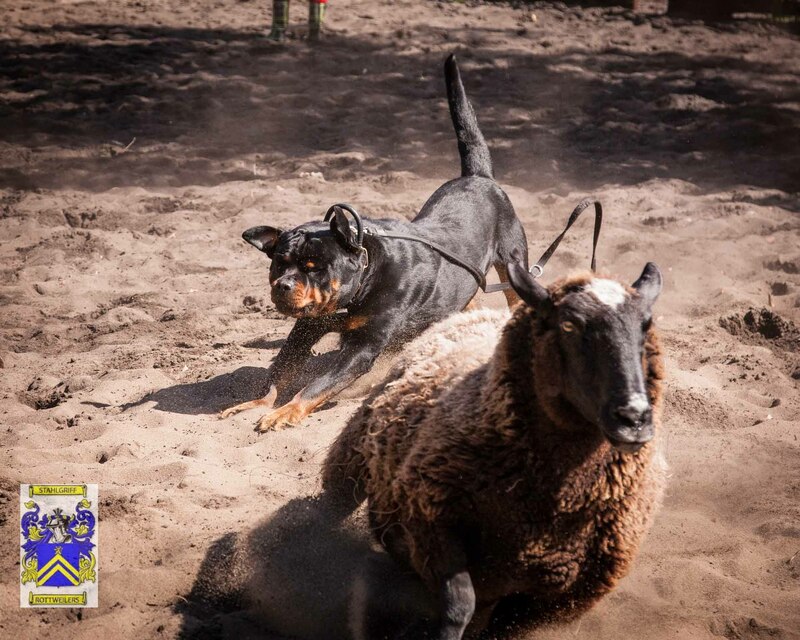 In fact, the Schutzhund escape and attack exercises can all be compared to the duties required by the properly bred and educated flock herding dog. DM Ch. World IPO CH. Unkas Von Hause Neubrand (Gmy) Holding in the blind. The herding dog should innately know to grip the sheep firmly by the top of the neck, no shaking and no growling. 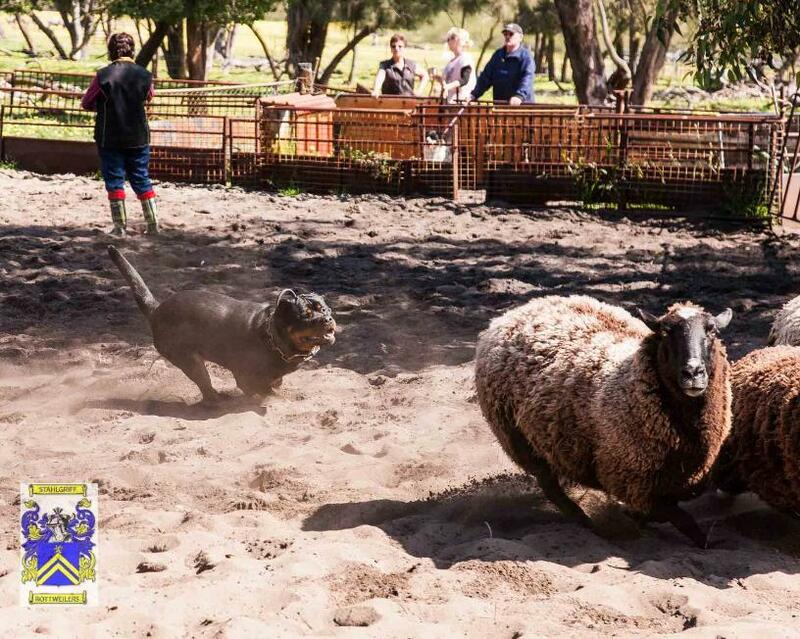 The dog should be able to hold the sheep with a firm full grip on the ground without harming the sheep. This enables the Shepherd to attend to the maintenance of the sheep. The dog must release on the “OUT”. The Shepherd of days gone by worked alone with one dog, this was the only way the Shepherd could maintain his flock. It is postulated that the good herding dog innately knows to only correct stubborn sheep on the back of the neck, shoulder and the area above the hock. 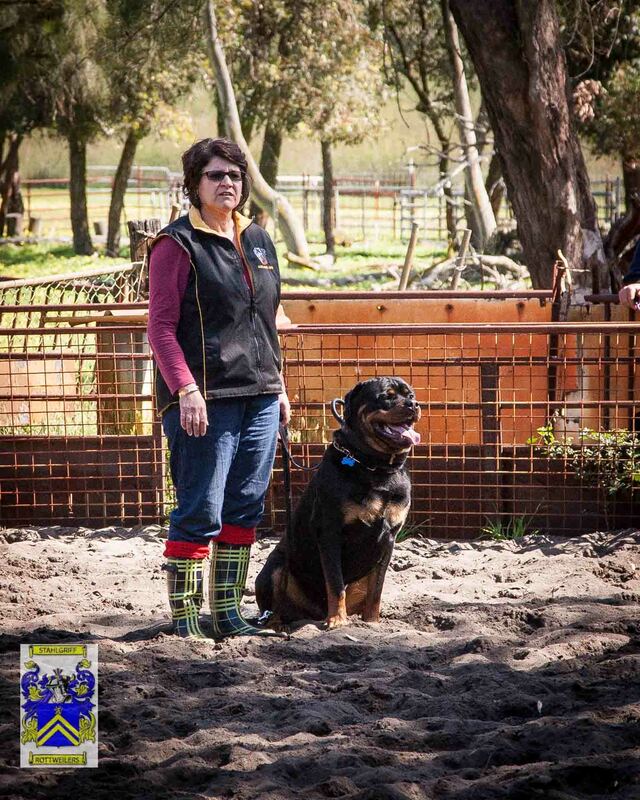 Consider Schutzhund obedience during the protection phase. 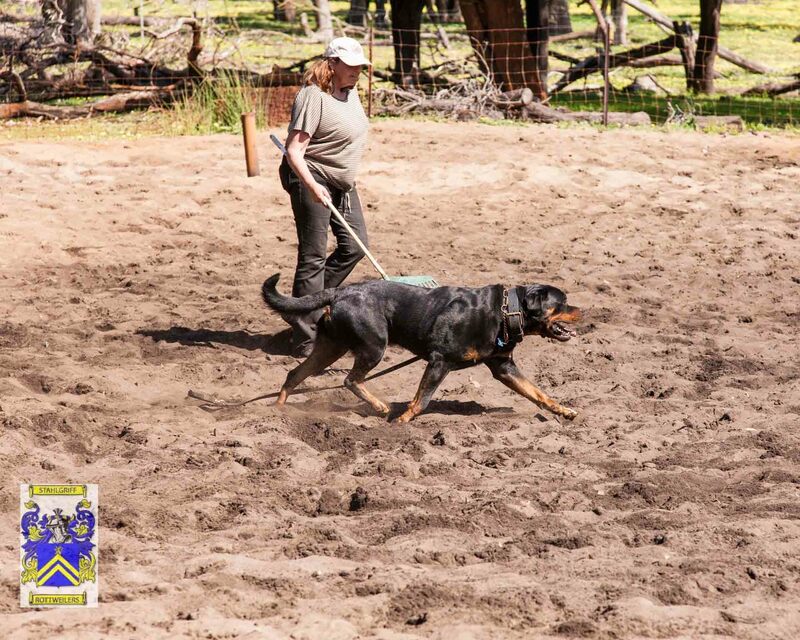 The Schutzhund dog must be under the control of the handler in a high-drive situation and so must the Herding Dog. Yet in both disciplines the dog must perform on its own initiative out of instinct. In both Schutzhund protection and Herding Dog the foundation of obedience is “STAY” and “OUT”. Without them you have no control over the dog in such a high drive situation. For control and obedience in a high drive situation, these commands must be obeyed in a high drive environment whether that environment is the protection field or the sheep graze. DM Ch. World IPO CH. Unkas Von Hause Neubrand (Gmy) Demonstrating the "OUT"
Those are some of the similarities. What would the difference be? It seems that the main difference between Schutzhund protection and Herding Dog work is in the nature of the work itself. The Herding dog must work independently at a great distance from the shepherd while the Schutzhund dog must work much closer to the handler and much more on verbal command. The Schutzhund dog is “trained”, the herding dog is “instinct” and “educated” guided in what is already innate and natural. 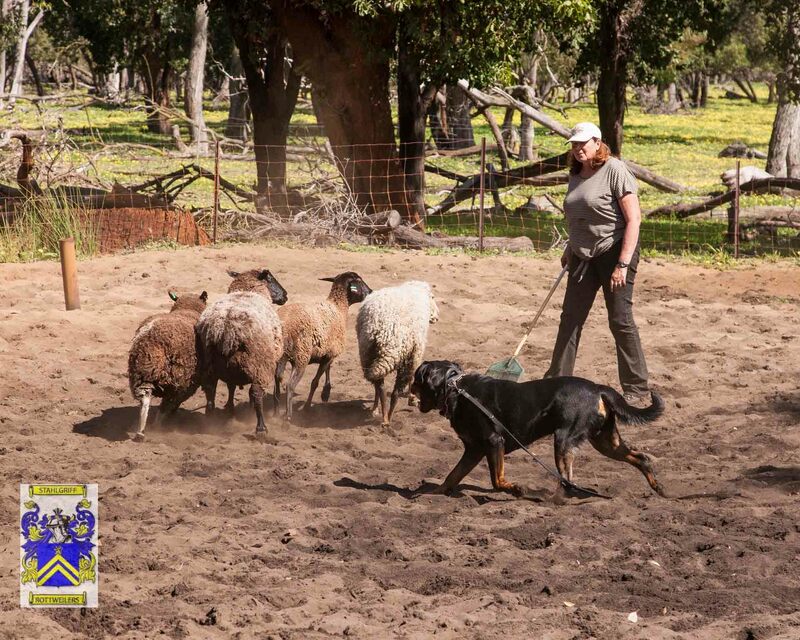 The herding dog must obey immediately a whole series of commands both verbal and hand signal from the handler to control the sheep and move them where is required. In sanctioned trails they must demonstrate the ability to be obedient in the face of an “active reward” ~ moving live sheep or whatever livestock. They must demonstrate the ability to down, stop, stay, send out, swing left/right and many more vocal and hand gestures. The Schutzhund dog must on command send out to search the blinds, the herding dog must obey signals from a great distance to swing left/right and much more. The Schutzhund dog, must demonstrate obedience and control on the field in the absence of any reward. 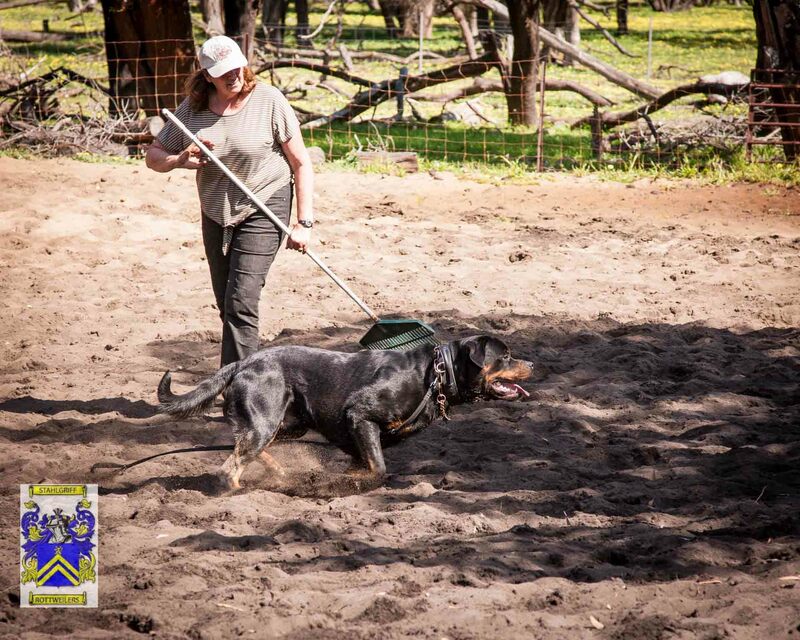 Some of these proofed commands in Schutzhund are trained with the use of external aides. Herding dogs are educated without tether and from a greater distance to obey the commands, no external aides can be used. Which is more difficult? I would say total obedience in the face of a live active reward is very difficult when adrenaline is running at full speed! No doubt training and education is an essential tool. A tool that can be used to enhance natural behaviors appropriately in the dog ─ behaviors that can serve man such as police K-9, guide dog, SAR, therapy dog, drug & bomb detection, sheep/stock herding. So it follows in the case of herding that when education is used as a tool to help encourage, improve, strengthen and develop ALL the natural genetic talents the dog brings with it to this job, then education serves to enhance what is already in the dog. Proper education should not distort the expression of those instincts. Proper education should make those instincts and behaviors serviceable ─ we can call that “education”. However, when training serves instead to put into a dog those same behaviors that are not naturally in that particular dog to perform, then training (& sometimes using external aides) becomes more a means of demonstrating the “trainer’s ability” to train the dog rather than nurturing and educating/guiding the natural, genetic ability to work. Over time the properly “educated” dog which has the genetics necessary for performing its particular work will be much better suited to perform this work willingly, independently and reliably than the trained, command/control dog which may, or may not, have the innate genetics to work. The properly “educated” dog by virtue of its genetics is far more likely to be able to perform successfully on its own in any new or unique working situation that might suddenly arise unexpectedly than the trained, command/control dog which has been taught to rely on commands ─ especially under the stress of a new situation. There is no place in either Schutzhund or Herding in the field for a dog that is not of sound character. In Schutshund, the dog is tested on the heel for its reaction to gun shot, but only a few times, the dog must show indifference to the sudden sound. In herding there is no place for a weak nerved dog on the field, one dog could be herding hundreds of sheep or cattle in all weather. The dog must be completely focused and control the herd often on its own. This dog must never be afraid of sounds, such as thunder, horns, gun shots from hunters, and run away, this would be a disaster!! Thunderstorms can go on for hours the dog must keep control of and focus on the herd for hours no matter how long or loud the thunder continues. The Schutzhund dog must demonstrate its ability to be athletic, to be able to retrieve an object and return. The herding dog MUST be athletic and physically robust. They must be able to jump fences and run after and retrieve sheep back over the fence. There is no place for the weak anatomy of the herding dog. The dog must have a strong cardiovascular system, strong bones, ligaments and tendons to take the punishing torque, torsion, twists and turns of herding fast livestock. The real test for innate prey drive comes from the formal testing in the arena of the herding instinct test. If a dog has true prey drive he will be fearless in the face of the livestock and face them, he will instinctively move them at will and retrieve breakaways. The dog with innate low drive will stand on the outskirts of the arena, demonstrate fear of the livestock. They will have no drive at all to the move the stock or retrieve breakaways back to the handler. The low drive dog will show indifference to the presence of the sheep, they will show little interest and be distracted. We have observed traditional herding dogs of today such as border collies paralysed with fear, no desire to work and have no innate drive, this was a revelation to behold. Drive can be “trained” by the Schutzhund trainer, is it real, true innate prey drive? The only “real test” is in the arena/field with livestock. The Schutzhund dog must display its ability to track on the field. The herding dog must track down wayward stock, the dog must quickly find the stock and retrieve them back to the Shepherd and the flock. In many counties this tracking ability is essential in the herding dog. Some countries do not have fencing, the dogs must contain the flock with an “invisible” fence. The herd can smell and be attracted to nearby fields growing produce. If the stock move onto the field the Shepherd may be liable to pay damages for loss and damage to the produce! The herding dog traditionally historically and to this day in some countries must demonstrate the ability to protect. To be fearless & courageous in the face of livestock, to protect the stock in some instances from huge powerful wolves. Some of these dogs must do this on their own, such as the revered Caucasian Shepherd of Russia. Herding dogs must be able to protect the lone Shepard from robbers and bandits and respond accordingly. It is not uncommon in some counties to this day for robbers to attempt to steal livestock, the dog must be able to respond without fear to preserve the stock. In days gone by the often poor Shepard worked alone, moving stock to graze a great distance from home. One dog was the only way to manage the livestock and this is still the case today. How many men would it take to manage a huge amount of moving livestock for days at a time, what would be the cost in poorer countries? It just is not possible. We observed 4 small dogs & two riders in the West Country of New Zealand move a herd of 500 cattle, it was no mean feat. The riders told us they could not manage the stock without the dogs. Nothing is flat in New Zealand, it is rocky, steep, slopes, impassable for any type of vehicle. Monuments are erected in New Zealand dedicated to the herding dog. In Australia, dogs are used to manage stock all over the country. 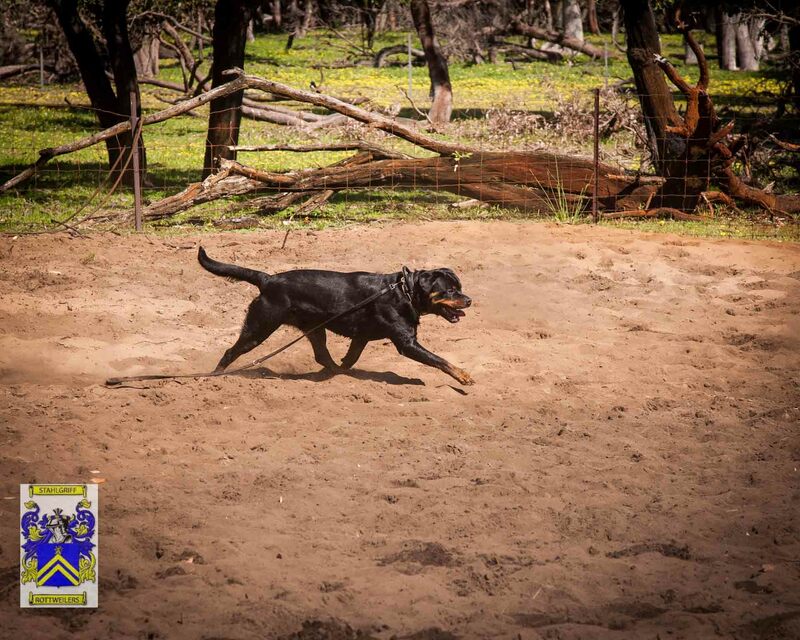 For the Rottweiler this tradition is somewhat lost, but surprisingly the breed has not lost its innate ability and instinct to herd, this instinct remains very strong. To this end we at Stahlgriff are very pleased that we can participate with our dogs in this ANKC sanctioned sport. Not only can our dogs benefit from the mental and physical activity but it also allows us to evaluate the robustness and health (both physical and mental) of our bloodlines.